You are here : TrackDebris » Sprint Cup Series » Auto-Spooning: Should there be a rules change? I’m not too keen on this new form of super speedway racing. Sure it provides a new challenge to the drivers, crews, teams and gives the fans new racing scenarios to debate over. But does it really represent what NASCAR racing is all about? To me, stock car racing is about 43 cars racing as individuals, driver against driver, car against car. Daytona and Talladega have always required partners to draft with, but not to the extent we are seeing now. A driver could dump one car for another or they could dump one line for another. When multi-car teams came into play, we also saw team mates rely on each other for drafting help. But again, not to the extent we are seeing today. So my question is…should there be a new rule that drivers cannot directly communicate with their team mate on their radio? It seems to me that it’s an unfair advantage that team cars can communicate directly with each other, orchestrating each others moves. However, if you have to hook up with a non team mate, you have the communication going from spotter to spotter. 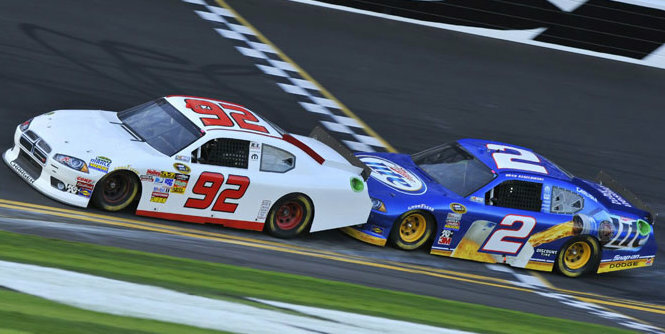 If we are going to have this kind of racing, perhaps NASCAR should just make sure all cars on the track have a level playing field. « If Dale were here today….